Another September comes, and with it a period of busyness and new beginnings. I’ve just started a new job at Weston College, which I’m really enjoying – it’s a great place, a super team, and bright students -, it should be fun. I’m also working towards the culmination of the Whose Data? project, with a performance at Knowle West Media Centre. The performance is part of my Why? And what does it mean?! project, and has been subtitled ‘The best time to plant a tree was ten years ago. The next best time is now.’ Long, I know, but we should never let that scare us! The performance is on the 13th October, between 4-8pm, at the Media Centre. If you’re in or near Bristol and can make it then it’d be great to see you there, but if you’re not, then it would be as well (if not even better) to have you watching online at the recently live whosedata.net. I’ve been working with the brilliant Dane Watkins over the past couple of months to develop a web interface that will operate as a kind of interactive live documentation / performance streaming space, in which people will be able to view, create and comment upon live data generated around the performance. The technical side is all thanks to Dane, I’ve just been developing the concept and being picky about the visuals! It’s still an experiment – I’ve certainly not come across something as multidimensional as this before – so we’d really love to see how people interact with it and what they think of it. Whilst this marks the end of my Whose Data? residency, I’m sure the project will have outcomes that will far outlive it. I came back last week from doing ‘All around the Field: Waterside’ Festival in Linz, Austria, which was a lot of fun. They’re always a slightly odd affair – arriving in a strange place, finding your directions and throwing up a performance, meeting lots of interesting artists and audience, and then (I speak for myself, at least) when you’ve gotten to know each other it’s time to leave again. There was some great work at the festival, some lovely artists (and super organisers), and we had a really nice discussion chaired by the brilliant Boris Nieslony. 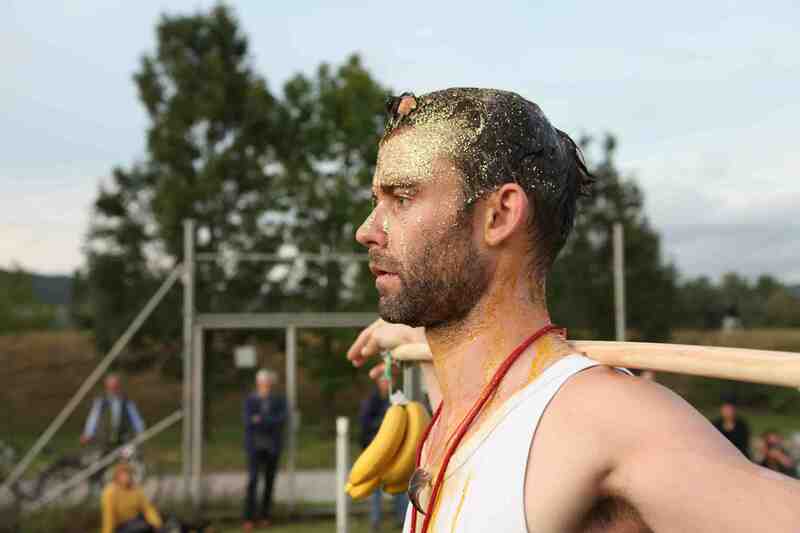 We talked about this, the concept and structure of a festival, and the idea of a laboratory (the organisers of ‘All around the Field: Waterside’ also run an event called Performance Laboratorium) which seemed to be something that many of us crave. I must reactivate plans for doing such a thing in Bristol, it feels like a really valuable and worthwhile activity. One final heads up / date for your diary, anyone in or near Bristol: BV Studios, where I hold a studio, is having its annual Open Studios on the weekend of the 14-16th October. After a really interesting conversation with the incredible Gwendoline Robin (wandering, post-performance, along the bank of the Danube) I’m considering a return to installation. Whilst for whatever reasons the focus of my practice has become almost exclusively on live performance in recent years, I was reminded that it hasn’t always been so, and that medium-specific distinctions are not necessarily always useful. I know this is by no means a radical proposition, but it kind of felt it for me, in a most exciting way. The challenge to move away from concretisation, break up some of what (I think) I know and then see what’s left.